Two worlds…one glass wall…no turning back. The human race has been divided. The chosen few live in the safety of the domes, watching through their glass walls as those left on the outside suffer and die. But desperation has brought invention, and new drugs have given the outsiders the strength to roam the poisoned night unafraid – but it comes at a price. Seventeen-year-old Nola Kent has spent her life in the domes, being trained to protect her little piece of the world that has been chosen to survive. The mission of the domes is to preserve the human race, not to help the sick and starving. But when outsider Kieran Wynne begs for Nola’s help in saving an innocent life, she is drawn into a world of darkness and danger. The suffering on the other side of the glass is beyond anything Nola had imagined, and turning her back on the outside world to return to the safety of the domes may be more than she can stand. Even when her home is threatened by the very people Nola wants to help. I absolutely LOVED this hard-hitting and addictive dystopian novel. It’s the first book I have read by the author and she is extremely talented in creating well-rounded characters and a riveting and thought-provoking read. 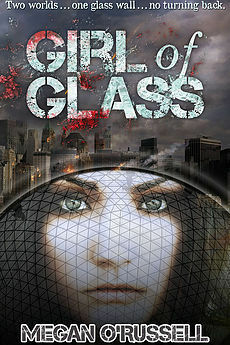 The central character Nola, the ‘Girl of Glass’ of the title, is flanked by two friends and would-be-lovers in an emotional love triangle: Kieran, who along with his father, has been banished from the domes for flouting its rules, and Jeremy a strict defender of the rules set by the dome dwellers and whose father is captain of the outer guard. The writing flows beautifully and I felt the emotions of Nola, Kieran and Jeremy and empathised with their respective predicaments. The book also features some strongly developed secondary characters and excellent world building. The lives of those outside the domes , whose existence revolves around survival in a hostile environment, contrast with those of the dome dwellers, a privileged and ordered elite dedicated to science and duty. The impact of the drugs that many outside the dome are compelled to take to survive is pivotal to the plot and I enjoyed this element immensely. Normally I shy away from books involving love triangles but here it worked for me, particularly so as Kieran and Jeremy, Nola’s friend and fellow dome dweller, shared a past history. I hugely enjoyed the tension filled plot as Nola is thrust into danger and is torn between two young men, whilst wrestling with her own moral compass in which she wants the best for all in the world and not just those fortunate to reside alongside her in the glass dome. Should she chose the safety and order of the domes dedicated to protect the few or the danger and chaos of the world outside, where death can be just around the corner? It is only a matter of time before these two worlds collide and Nola will be caught in the crossfire and forced to choose. A super read, one I’d recommend to teenagers and above. Please note that a copy of this book was given to me by the author for the purpose of a fair aand honest review.